Mixed media on resin, limited edition in 30 works, signed and numbered in original. 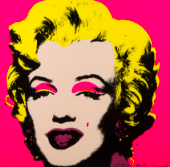 The work is given with Certificate of Authenticity by the Artists. Behind the nickname Hackatao, there is an ecletic artistic couple that in 2007 decides to create the Podmorks, these funny and coloured beings (maybe ufos or dreamy monsters). The two artists are Nadia Squarci (Udine, 23.12.1977) and Sergio Scalet (Transacqua - TN- 06.08.1973): a couple both in real life and for work. Both of them move in Milano when they’re young, and both come from the advertising world - she was an artdirector and he a creative - and in 2006 they start the artistic project of Hackatao. For years they live in the creative neighborhood of Milan, Zona Isola, but now they move in the calmer little medevial village Oltris near Udine. 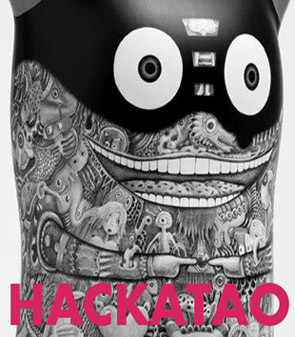 The word Hackatao puts together the two differents words Hacker and Tao: the first is the ability to go further the limits with genius and creativity in order to achieve a goal; and Tao, the union of two elements that can generate a life flow. The podmorks, aren’t just funny coloured beings born in the toy culture. Behind these sweet eyes and the funny monster-shape, there are some important considerations about everyday life and human soul. “The Podmork are the expression of the deepest emotion, in the simpliest way”.